Founded in 1989, the Orlando Magic may not have the years or the experience. What they have achieved in a relatively short period of time is success. The Orlando Magic are the second most successful of the four expansion teams established in 1988 and 1989 in terms of winning percentage. As of 2017, the team has played in 28 seasons, out of which it has made it to the playoffs 14 times. In addition, the Magic have been to the NBA Finals twice. This impressive record has been possible by the likes of Shaquille O’Neil, Vince Carter, Tracy McGrady, Grant Hill and Patrick Ewing, among others. And though the team has not been to the playoffs since 2011-12, with players like Aaron Gordon and Nikola Vucevic on the roster, the team’s upcoming season could be different. The Magic are locked and loaded and are poised to make themselves known in the Eastern Conference. Led by a highly talented youthful core, Orlando is ready to reign atop of the Southeast Division and bring home an NBA championship. Division rivals, the Miami Heat and the Charlotte Hornets will look to stand in their way. Get your Orlando Magic tickets and head down to the Amway Center to be a part of your team's championship run. The Magic were the first pro sports team in the city of Orlando. As one of the youngest teams in the NBA, only 28 years of age, the Orlando Magic has seen many ups and downs. They have also produced some of the greatest moments in professional basketball history. Shaq “The Rookie” O’Neil Not many had heard of Shaquille O’Neil in 1993. However all that changed on November 20. The Magic were playing against the Nets at home at the Izod Center, when the young rookie gave one of the best performances of his career. With 24 points, 28 rebounds, three assists and an unheard of 15 blocks, Shaq simply obliterated the Nets. Shaq’s 15 blocks are an NBA record since 1985 as well as a franchise record with little chance of being broken. T-Mac, The 62-Pointer On March 10, 2004, at the TD Waterhouse Center, Orlando, Tracy McGrady did what very few had done before – he dropped 62 points. And that’s not all. With 10-rebounds, and 5-assists, he ended the game with a 20-for-37 shooting average. With this performance, T-Mac joined the elite club of only 15, who had scored 60 points or more in a game. Miami Heat is one of the biggest rivals of the Magic. In addition, the Atlanta Hawks are also Magic’s biggest competitors, especially when it comes to the playoffs. Magic-Heat – The Orlando Magic and the Miami Heat rivalry is essentially an intra-state rivalry, since both are Florida-based teams. This rivalry is also called the Sunshine State rivalry. The fact that both teams have attracted some of the biggest stars, it has further intensified the rivalry. With Dwight Howard and Dwyane Wade in Orlando and Chris Bosh and LeBron James in Miami, the Sunshine State rivalry sizzled from 2010 till 2014. In addition to their regular season games, the two have also met once in the playoffs, the contest which the Heat won. The rivalry has somewhat softened with the departure of Dwight Howard. Magic – Hawks – This is essentially a playoff rivalry where the two teams have met twice in the playoffs in 2010 and 2011. The rivalry is equally balanced as the Magic swept the Hawks in 2010, while the Hawks took their revenge the following year. For a 28-year young team, the Orlando Magic have amassed impressive statistics. 28 years of existence isn’t a long time for a sports franchise to boost names of ace-basketball players, but then the Magic are no ordinary team, thanks to these on court “magicians”. Shaquille O’Neil – The Shaq was perhaps one of the greatest centers to ever play the game. An exceptional player and human being, both on and off the field, Shaq combined size, strength, agility and athleticism. His personality made him an incredibly likeable person who could connect with the fans, unlike some of his contemporaries. Anfernee Hardaway – “Penny” Hardaway could have been the best point guard of all-time had it not been for his injuries. Nonetheless, Hardaway scored, rebounded and distributed the basketball like no other and his duo with Shaq took Orlando to NBA Finals once. Dwight Howard – Howard may be no Shaq, but when it came to rebounding and shot-blocking, Howard was as good as Shaq. He led the Magic to the NBA Finals in 2009 and then again in the Eastern Conference Finals in 2010. With Orlando Magic tickets 2018 in hand, you will find yourself witnessing the best professional basketball has to offer at the Amway Center. Whether you’re coming to town to see Mickey and the gang or you’re a local, a trip to the sparkling new Amway Center is an absolute must. Opened in 2010, the arena hosted the 2013 All-Star Game and is easily one of the best buildings in the league. Fans can enjoy festivities before and after contests with the fan fest plaza and the arena features a rooftop lounge that offers fans a chance to keep the party going and enjoy some of the best views of downtown Orlando. Of course, the Magic fans would want to see one more thing with these tickets – their team making the playoffs. So, get your tickets here and see the Magic work their “magic” again. Our process for purchasing cheap Orlando Magic tickets is simple and fast. There are so many online ticketing sites, that it can be hard for customers to find the right place to buy Orlando Magic tickets at the cheapest price. At ScoreBig we think of our customers first and foremost. We offer daily deals for Orlando Magic events, so our customers can get the best seats for the best prices. ScoreBig will always go above and beyond to offer the cheapest Orlando Magic tickets on the market. The Orlando Magic schedule above, displays all available events for 2019 and 2020. Once you find the event that you would like to go to, click the red “Get Tickets” button. It is located on the right-hand side of the event listing, it will take you to an Orlando Magic event ticket page. ScoreBig's event ticket page will display all available Orlando Magic tickets for that event. On the event ticket page to help with your search for the right Orlando Magic tickets, use the filters at the top to select quantity, price range, and more. There is also an interactive seating chart so you can pick where you want to sit. When you are ready to buy a ticket, click on the listing, and you will be directed to ScoreBig's checkout page. Upon completion of the information fields, your order will be processed and your Orlando Magic tickets will be delivered via email, mail, or to your mobile device. What makes ScoreBig’s site stand out from the rest? We are constantly analyzing our competitors to improve our site, service, and prices. ScoreBig.com employees strive to offer the best process and experience to buy cheap Orlando Magic tickets. Our goal is to get you the best seats to Orlando Magic events. We offer daily discounts on our site and for special promotions check out our newsletter. If there are no Orlando Magic events currently available, you can use our search feature at the top of the page to see a list of all popular events going on near you. No matter your price point, we have all the best deals and discounts on Orlando Magic tickets. For more information on prices of Orlando Magic tickets and the schedule for Orlando Magic, check out our listings above. The last thing you want to find out is when the Orlando Magic event you wanted to go to is sold-out. Don’t worry in many cases ScoreBig has affordable tickets to sold out events. We sell tickets from GA all the way to premium seating and parking. Skip the scalpers in the parking lot and get your tickets online from top Orlando Magic ticket brokers. We get you in all events, buy your Orlando Magic tickets here from a brand that many trust and rely on for all their ticketing needs. ScoreBig offers a 100% money-back guarantee. If you have been in search of cheap tickets for Orlando Magic, ScoreBig by far is the best option. That’s why ScoreBig has more loyal customers than any other ticketing site. 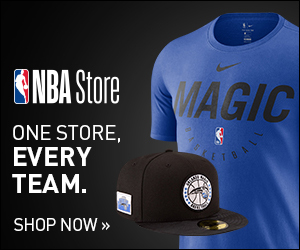 Shop at ScoreBig for safe and secure Orlando Magic event tickets.